Someone at Boston Dynamics has a great sense of humor. The company, which is a robot R&D epicenter, just posted a job opening for a Robot Evangelist. Seriously! The evangelist's job is to sell the world on commercial uses of their animal inspired robots. Robotic applications include commercial security, logistics and construction. This move by Boston Dynamics underscores a big push for market-driven, money-making, widespread use of robotics across industries. Boston Dynamics' roots are deeply intertwined with DARPA, the US Defense Department's Advanced Research Projects Agency. DARPA's mission is to develop breakthrough technology that provides the US military overwhelming competitive advantages. 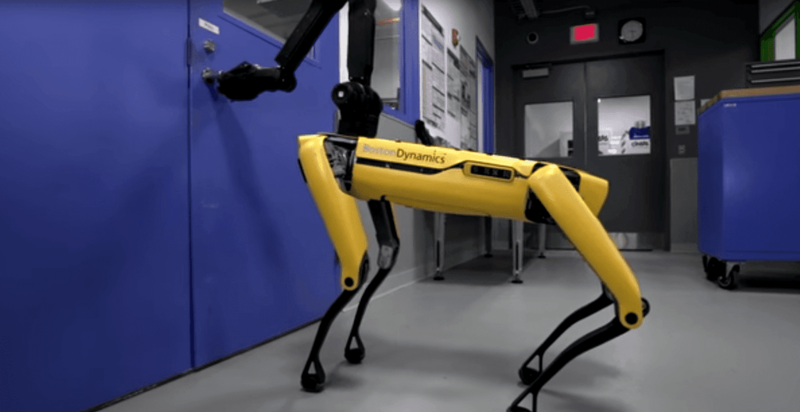 Over the years, DARPA has funded Boston Dynamics robotic programs with an estimated $150 million. The investment is well worth it. The company has created the world's fastest, biggest and most agile robots. Robots including Big Dog, ATLAS and the WildCat are very effectively used by the military in battle-zones and disaster areas. Boston Dynamics was founded and is run by MIT roboticist Marc Raibert. Several years ago he sold it to Google which wanted to change the military development focus to commercial development. Google recently sold the company to the Japanese tech giant SoftBank, which is pushing the pedal to the metal on commercialization. SpotMini is opening the door to commercial business growth for Boston Dynamics. And, yes, it does open doors for other robots. It's the company's first commercial product and is targeted at businesses as a camera-equipped security guard. It goes on sale next year. And is the start of a market driven focus for one of the world's best R&D tanks for developing robots with animal locomotion. Hence the need for a Robot Evangelist to go global.